It goes without saying that Too Faced seem to be constantly creating new must-haves by the bucketload of late, and the newest collection to drop at Mecca Maxima is full of exactly that. It also introduces some fresh, new shades to some of the brand’s most popular releases, increasing its profile as a beauty name that champions diversity. 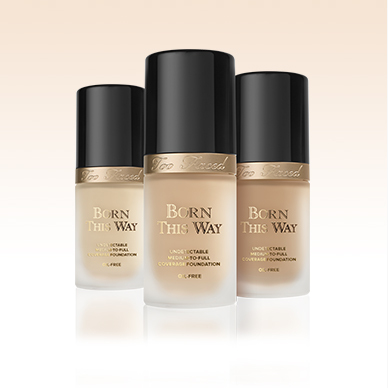 Their legendary Born This Way oil-free foundation has been a hit since its release, masterfully diffusing the line between makeup and skin and really giving the appearance that yes, #IWokeUpLikeThis. It may be a medium to full coverage formula, but that coverage is so undetectable that when it’s shade matched right, it really does look like flawless, radiant skin. Oil-free and paraben free, it is boosted by the benefits of coconut water and hyaluronic acid so is a great pick if your skin is on the dry side, and the creamy liquid formula packs a ton of pigment, so a little goes a long way. Oh and it also has no discernible scent, which is a bonus for many makeup wearers that prefer their foundation fragrance-free. So with all this in mind, what could Too Faced do that could make this beauty better? Well introduce six new shades, meaning it’s available in a total of 24! A second skin that matched pretty much any skin tone? You gotta love that… Too Faced have also released six new shades of Born This Way Concealer to go with, which was equally as thoughtful of them! Also on the base side of the new collection, the brand has release the brilliantly named Hangover Primer and Setting Spray, which is a weightless, 3-in-1 coconut water-infused mist, made to prime, set, and refresh makeup, while hydrating the skin like never before. To use as a primer, simply shake the bottle well, hold it 6-8 inches away from your face, and apply before your makeup. To use as a setting spray that lasts all day, simply spray after applying your makeup. To use as a mid-day refresher, apply anytime your skin needs a boost, serving as the perfect cure for a beauty “hangover”. The unique combination of coconut water, probiotic-based ingredient and skin-revivers work together to hydrate and brighten skin, promote skin’s elasticity and tone, and soothe and smooth the skin. The perfect product for the upcoming party season I reckon, and one I can’t wait to get my hands on!